Capacity Plus - ConnecTel, Inc. The Capacity Plus expands the capacity of MOTOTRBO™ communication system. Thanks to this system you are able to quickly and efficiently share business-critical voice and data communication on the same system without having to add new frequencies. And that all with over a thousand radio users. With Capacity Plus, you can expand and optimize the full capacity of your MOTOTRBO™ system while you transmit business-critical information. And you can do this without the cost and inconvenience of purchasing additional infrastructure. Capacity Plus is the intelligent software solution that links up to 1,200 MOTOTRBO™ radio users to voice and data without adding new frequencies. Your employees can exchange information with voice communication and also share data, all on the same system – whether they’re receiving work order tickets from guest services, text messages from the manufacturing line or location updates throughout the port. When your workforce is well connected, it is much easier for them to quickly address customer requests, handle tasks and complete repairs. 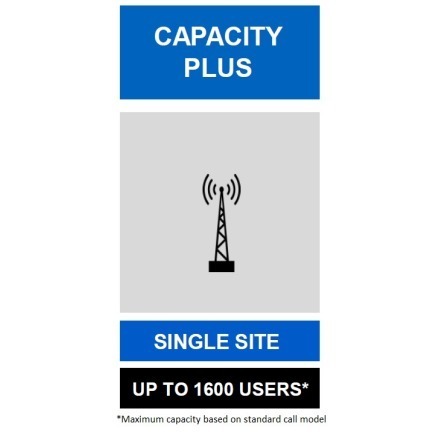 Because Capacity Plus offers the convenience of exceptionally clear voice and data communication in one device, you can talk with your staff throughout the facility, even with the roar of the crowd or loud machinery on the production line. Plus you can receive text message updates on production levels and find employees faster with GPS location tracking. Our high capacity, single site solution will fundamentally change the way they work. Now employees can access work order tickets right on their radio for faster response times to guest requests, send text message status updates on a high priority order or better customer service and dispatch security personnel to an incident for faster response times to emergencies. See why Capacity Plus is a much-needed plus for the way you do business. Keeping your operations running smoothly during a change in communication systems is vital to your business. That’s why MOTOTRBO™ radios are so flexible. With an option board upgrade, they can be configured to operate on your existing LTR® or PassPort® analog trunking system. Then when you are ready to migrate to digital trunking, with just a Capacity Plus software upgrade, you can begin moving on your own terms -- one talk group or one department at a time. You also have the opportunity to integrate Android and iOS mobile devices into your network. WAVE 3000 is an Enterprise Push-To-Talk over Broadband solution. It uses a free app from Google Play or the App Store to connect over Wi-Fi or cellular to a gateway in your MOTOTRBO™ Capacity Plus system. For those who need extra reach, choice and flexibility, WAVE 3000 is the ideal choice.